Hand the deck out for shuffling. During the shuffling, patter briefly about the concept of tells at poker and other card games. After the shuffle» take the deck back and deal out a five-handed game of draw poker (i.e., five cards to each hand). Deal one hand to each of four spectators and the fifth hand to yourself. As you do so, explain that you'll use these hands to demonstrate your skill at reading tells. Instruct the four spectators to pick up their hands and mix the cards. Then tell them to fan out the cards and look at them as they would a poker hand, so that no one else can see the cards. Each spectator should then think of one of the cards he's holding. Stress that he can think ol any one of the five cards, but once he settles on one card, he should ignore the others and just burn that one card into his memory. Once each spectator has thought of a card, instruct him to mix his five cards again. 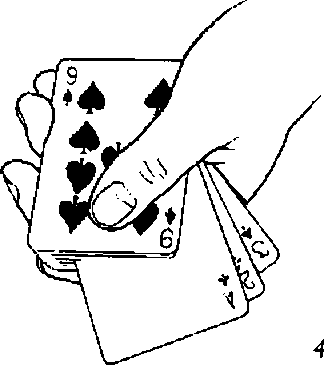 Throughout these instructions, use your own poker hand to Illustrate what the spectators should do. cards in each hand is the key to the effect. Caution the spectators not to pick up their hands. If no one has seen the card he's thinking of, drop the hand on top of the deck. Pick up the next hand and display it the same way. Let's assume that one person sees his card in this hand. Tell the spectator that you're going to show him each card and ask him each time whether it's his card. In each case he should answer no. Do ao, keeping the cards in order. Explain that you think you detected a tell. Look at the five cards and remember the card that is one card lower in the hand than the spectator's numerical position. This is the key to the effect. You don't know which hand contains which spectator's card. You do, however, know that the first spectator s card is second from the top of whichever hand it is in. The second spectator's card is third from the top in its hand. The third spectator's card is fourth from the top, and the fourth spectator's card is fifth from the top. The only thing you don't know is which hand contains which spectator's card. The spectators themselves tell you that. Having memorized the spectator's card, mix the five cards again, then remove his card and place it lace down in front of him. Drop the other four cards on top of the deck. (It's important that you mix the cards before removing the spectator's card. Otherwise, he will be able to tell from the card's position that you got the right one. You want to keep that in doubt until the revelation.) Have the spectator name the card he thought of. Turn the tabled card face up to show that you succeeded. Pick up the next poker hand and display it to the remaining spectators as before. Ask if anyone saw his card. (Any time you show a hand that doesn't concain anyone's card, drop it on the deck.) Let's assume that the third spectator says that he saw his card. This immediately tells you that his card is fourth from the top. Explain that you will show him the cards one by one. In this case, he should not say a word but only look at each card as you study his eyes. Except for the fact that there is no verbal element this time, you repeat the process you did with the first spectator. Eventually, you place his card face down in front of him. Have him name the card he thought of, then turn it over to show that you were right. Eventually, you will have determined the fourth spectator's card. This may happen in one of three ways. First, the last two spectator's cards may be in the same hand. In identifying the third spectator's card you also spot the last spectator's card. Alternatively, after finding three spectators' cards, you hold up another hand and the last spectator verifies that his card is there. The last possibility is the best. It will sometimes happen that after showing four hands, three spectators will have spotted their cards and the last will not. You therefore know that the last spectator's card is in the one hand you haven't shown. Of course, you know which card it must be by its numerical position in the hand. This means you've nailed his card without his ever even seeing its face during the second round of poker hands. Whichever is the case, gather up all the cards (except the three identified selections, which should remain in front of their respective spectators), contriving to bring the last spectator's card to the top. By means of either overhand or riffle shuffles, control the card to fifth from the top. Explain that, because you've been so successful in the first three tries, you're going to challenge yourself by using the whole deck for the last attempt« Tell the spectator whose card you've yet to find that you will show him cards one at a time. Each time he is to respond, "That's not my card." Turn over the top card of the deck, mimicking whatever handling you usually use for multiple turnovers. When the spectator denies the card, turn it face down, and toss it one the table. Repeat this with the next card. You apparendy repeat the process with the third card also. This time, however, you perform a triple turnover. The spectator will be looking at his thought-of card. When he denies it, turn the triple face down, and toss the top card onto the table. Turn over a single and repeat the process, dealing the card with the others. The fact that this is an indifferent card seems to confirm that the last card you dealt really was the selection. The card now on top is the selection. Periorm a double turnover to show an indifferent card. Announce that you've determined from the spectator's unconscious tells that this is his card. Turn the double face down and take the top card into your right hand. Hold it back toward the audience. Have the spectator name his card. He will, of course, correct you and name the right card. (Often he'll point out that his card is on the table.) Play up the miss as much as you think appropriate.